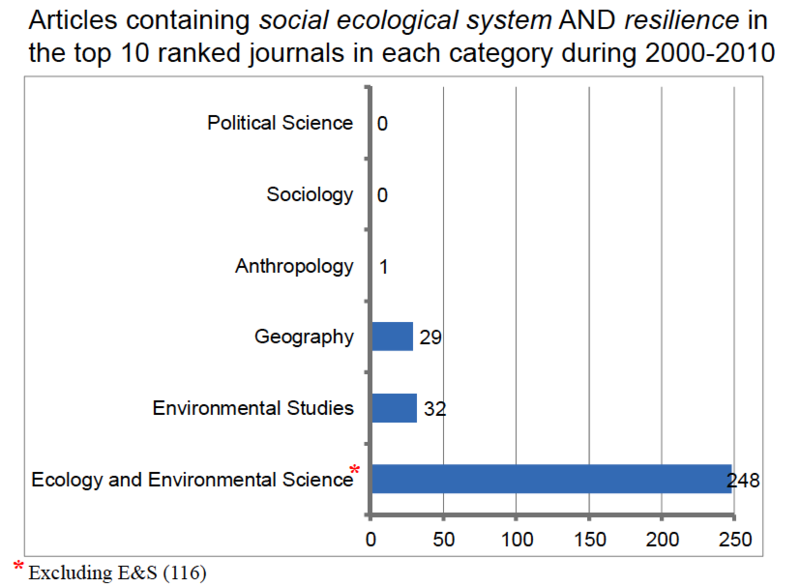 I think many of us working on resilience are interested in building a new sustainability science, and while this requires engaging with many social scientists this does not require publishing in specific journals. Indeed new areas of research often produce new journals, such as GEC or E&S, or new subfields in existing journals – such as sustainability science section in PNAS. Such issues are common in science in general, not just in resilience research. Climate change, materials science, computer science, cognitive science, etc – have all faced similar issues. The link to the Arizona conference above doesn’t actually list Lennart Olsson’s ‘interesting and critical’ presentation. Was it considered too critical to be included at the time? and who beneﬁts? To what and with which side-eﬀects? By when? development and this is the main aims of this panel. about the concept of adaptiveness from a governance perspective. problem of adaptiveness in earth system governance.